Beaumont, TX--It’s not every day you see 800+ people at a tree lighting ceremony at a jewelry store, and at that, one that’s not even open! 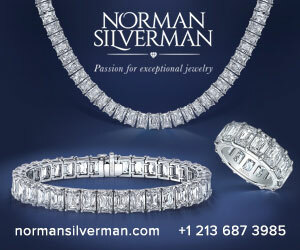 But that's exactly what happened last week at Alter's Gem Jewelry. The Centurion asked Brian Alter about his company’s fifth annual tree lighting. 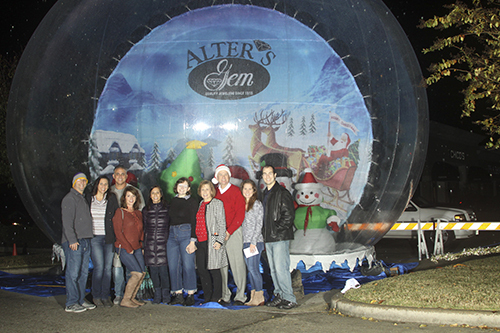 At left, Brian Alter (red sweater and Santa hat) poses with his family in front of a custom snow globe, this year's special new addition to the event. Guests could go inside the globe and have their photos taken. Alter searched for a custom giant snow globe in the United States but nobody here builds them. The 24-foot globe was manufactured in Ghaungzou, China. "It was all a gamble. I found a company on Alibaba that was well rated," says Alter. "We emailed and 'WEChat' back and forth. I had to wire the money, including the shipping costs, import duties, taxes, etc. which were surprisingly high, in full in advance. But I believe 99% of the people in this world are honest, and this company is. It arrived two months late so I was a bit nervous at times, but it did arrive." Alter emphasizes this event is a celebration, something his company gives to its community. It's not a sales event. Part of his community commitment is that the store is closed during the event, and Alter does not solicit publicity--but it finds him! The giant Christmas tree at Alter's Gem Jewelry. “We do not want anyone to believe or think this is anything but a goodwill ‘Thank You’ event for our community,” says Alter. “It started to celebrate our 100th year five years ago. We are trying hard to make this an annual tradition for our community, always on the night of Thanksgiving Eve. This year we had a news channel show the lighting live, and we made the “November Events” lists in all our local hotels/motels,” he told The Centurion. 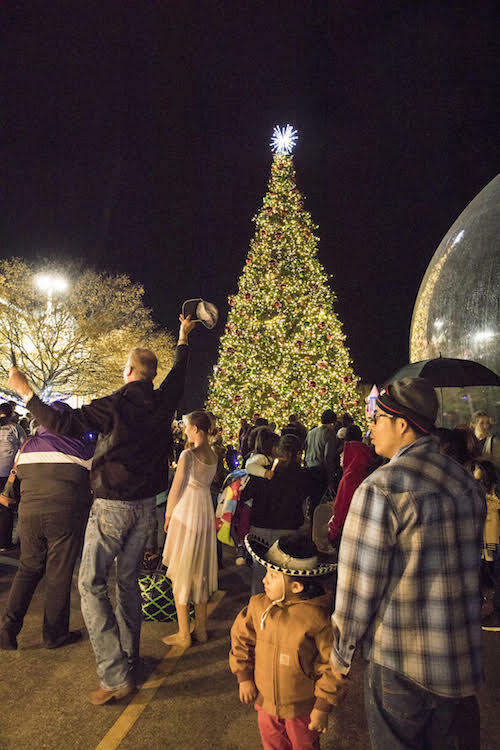 A crowd of 800 gathered around the giant Christmas tree. 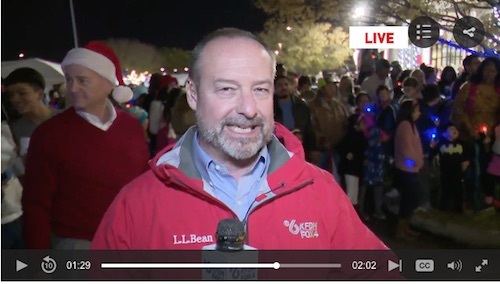 KFDM-TV6 did a live broadcast from the tree-lighting event. Click here or on the image above to watch. 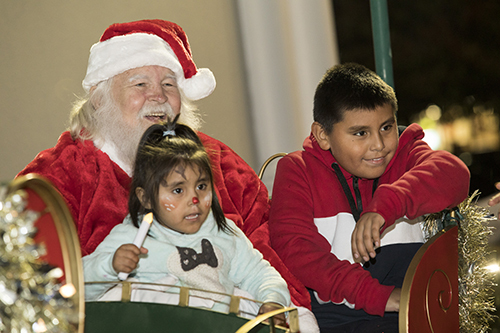 What would a tree ceremony be without Santa Claus? Of course the jolly old elf had to fly in for a quick visit. 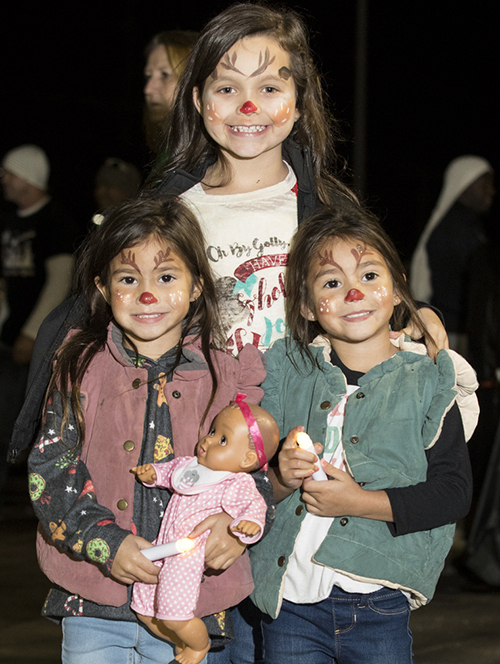 Happy kids with reindeer faces painted on. What is Alter’s favorite part of the event? The whole thing! 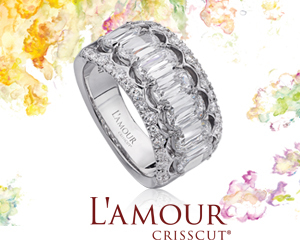 “My favorite part is truly all of it! Planning it and adding a new feature each and every year. I love watching the kids and adults enjoy Christmas spirit. Seeing the smiles of our participating vendors (some are paid, some volunteer) as they love it as well. “My favorite view is of our 36’ tall tree with 25,000 lights each and every night. Seeing families come to our parking lot just to take a family photo in front of our tree day and night. Last year when it snowed here (a rare occurance) we had over 100 people in our parking lot between 3-5 a.m. taking photos with the tree in the snow. I know because I came to do the same thing. 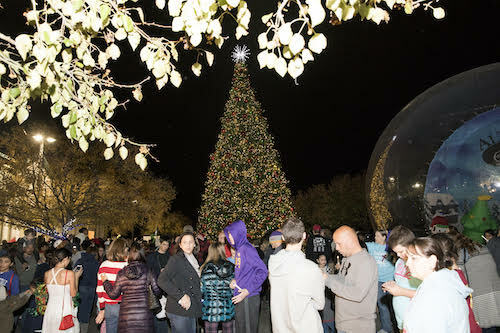 No matter how bad or good my day might be, seeing our tree lit up always brings a smile to my face,” says Alter. Alter's family also had a special reason to celebrate. Alter's adopted sister, Wendy, recently found her birth family and was welcomed with open arms. The two families have been getting to know each other, as Wendy, her found siblings, and their families joined the Alters for Thanksgiving, for a total of 42 people, said Brian Alter. Pictured in front of the snow globe are Brian Alter in the red sweater and Santa hat. To his right are his wife Lori and their youngest daughter, Arianna. To his left are their oldest daughter Devon and her husband Brandon. Missing are their son, Daniel, and their middle daughter Carly and her husband Andrew. Next to Arianna is Alter's sister, Wendy. To Wendy’s right are Kim and Wendy’s found brother Billy, and Wendy’s found sister Sharon and Bryce. Two more new sisters and their families are not pictured. This is the best thing I’ve read in a long time! Just love it. I think do whatever you love, and do it over the top, like Alter’s has. Well done, Brian!